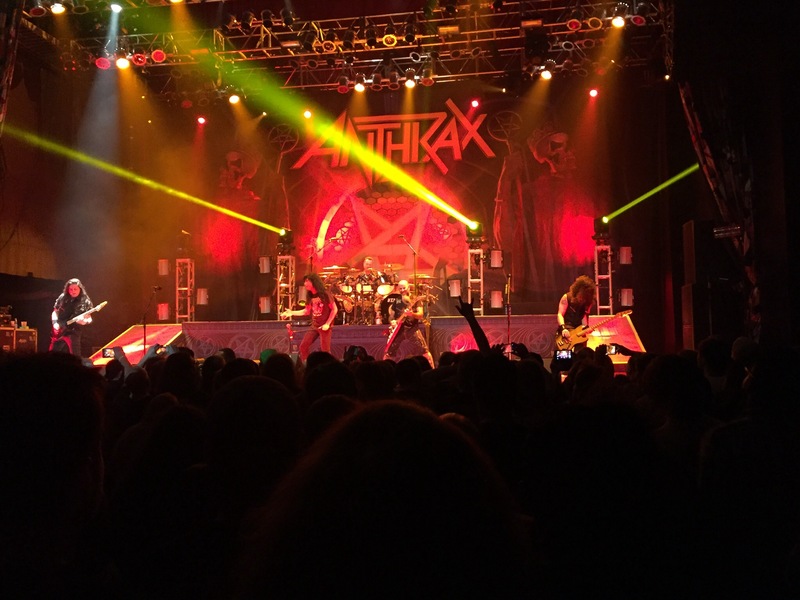 Thrash metal legends Anthrax have played Dallas three times over the last year and half. Each of these previous gigs saw the band supporting other acts, like Volbeat, Lamb of God, and Slayer. When the co-headlining tour with Killswitch Engage was announced, the word was the bands would be alternating the headline spot. Thus, it came as a relief and a source of joy that Anthrax would be headlining this Dallas date. Killswitch Engage played an hour and fifteen minute set that spanned six albums and culminated with Anthrax’s Joey Belladonna and the band covering Ronnie James Dio’s “Holy Diver.” The band was firing on all cylinders and the audience on hand ate up every second. Songs from the albums As Daylight Dies and Incarnate seemed to get the biggest response from the crowd, but every song was met with enthusiasm. The band fed off the crowds energy and reciprocated with a tireless set that left no head un-banged. Anthrax opened their set with “Among the Living” and “Caught in a Mosh,” making the crowd instantly giddy with excitement. Throughout the show, each member of the band was flawless in their performance. Lead guitarist Jon Donais nailed every lead and solo like he has been in the band for decades. Drummer Jon Dette filled in for Charlie Benante, though you would be hard pressed to find any element of his drumming below the standards set by the band. He has all the speed, finesse, and timing needed to anchor the band and the songs. The always reliable Scott Ian (guitar) and Frank Bello (bass), played with as much precision as any of their peers and brought an infectious and tireless energy to the set. Anthrax @ House of Blues, Dallas. Photo by J. Kevin Lynch. Classic songs, like “Madhouse,” “Antisocial,” and “Indians” were right at home alongside material from last year’s For All Kings LP. The thrash of “Evil Twin” and the epic and beautiful “Blood Eagle Wings” stood out among the highlights. More than anything, Joey Belladonna seemed to stand out for me. Doubtless, it isn’t discussed enough that among the Big 4 of thrash metal, Anthrax has the best singer. Belladonna is a consummate front-man/singer. He of boundless energy, Belladonna never missed a note, constantly engaged the crowd, and seemed to have as much fun as anyone else in the house. Whether he was pulling guitar picks from his guitarists mic stands and flipping them into the crowd or pointing out various fans and pumping his fist in approval, he was on a mission to make sure everyone had a great time, and we all certainly did. Whether you catch Anthrax or Killswitch in the headlining spot, both bands play for over an hour. Regardless of who plays last, they are sure to deliver everything you want in an evening of metal. We highly recommend checking out this tour when it comes to your city.